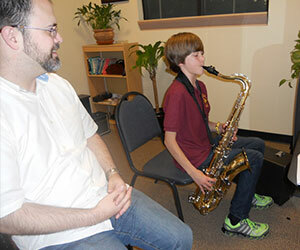 How old does my child need to be to take saxophone lessons? Generally the child needs to be able to support the weight of the instrument with a neck strap, and be able to reach all the keys comfortably. Most children can do this by around 5th grade. If the child is ready before this age, great! If not, starting on another child-friendly instrument is recommended, switching to saxophone when the student is ready. Where can I purchase or rent a saxophone?